In 1990, Michael Grace began building single order custom audio products for a small, devout following of recording engineers and artists . Before long, the word had spread about these custom microphone preamplifier designs, which were said to outperform anything else that was commercially available. In 1994, Michael partnered with his brother Eben and Grace Design was founded and began production of the model 801 microphone preamplifier. Not only did the model 801 provide a new level of audio performance and functionality, it helped to establish the outboard microphone preamplifier as a new keystone in professional audio production. Over the years, Grace Design has maintained a steady, methodical pace to developing new products and technologies. The m905 represents a new benchmark for audio playback quality. DAC performance is on par with the finest esoteric mastering equipment available. The redesigned s-Lock™ PLL ensures ultra-low jitter clock regeneration. An asynchronous USB class 2 interface allows the m905 to act as the master clock of the computer's USB audio buss, effectively eliminating interface induced jitter for computer audio playback. And finally, meticulous analog circuitry measures with outstanding numbers in dynamic range, distortion and noise performance, ensuring bracingly open, detailed and musical playback of any input source. 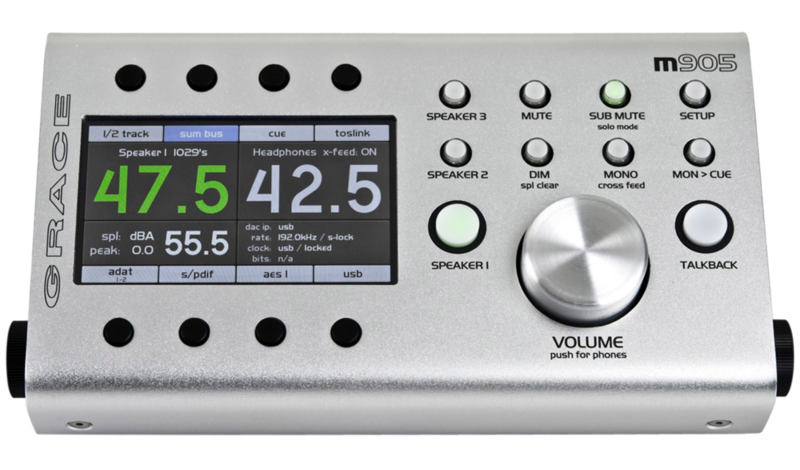 The m905 offers the ability to transfer up to 10 channels of digital audio (8-channels of ADAT and two of AES3, or S/PDIF or TOSLINK) over USB to a computer, making the m905 capable of operating as a standalone USB audio interface. This is an advanced feature as there are clock issues to be aware of, but it works and is documented in the owners manual. There are a range of options available for the m905 such as phono preamp, infrared wireless control and analog ins only. Call us for further information. The m103 starts with the tried and true m101 microphone preamplifier circuity. For many engineers, the m101 is an introduction to what quality mic preamplification is all about, and the perfect starting point for a channel strip – musical, transparent and pure. Headroom, detail, clarity – its all there. Complete with our exclusive ribbon mic mode, a 75Hz HPF and 48V phantom. The 3 band EQ section is built around a single stage parallel tuning architecture, which minimizes circuitry and delivers natural tonal shaping from 20Hz to 20kHz. Controls include a fully parametric mid, with sweepable high and low bands which can be operated in shelving or peak modes. The accuracy of this design allows for smaller increments in cut or boost, providing a greater level of control over tone shaping. The compressor circuit is based on an optical attenuator - the purest, high fidelity gain control mechanism available. It provides gentle limiting to fairly heavy compression, while remaining neutral and transparent. The perfect way to zip it all up and send it downstream - clean, intact and alive. 10 segment gain reduction and output meters make monitoring compression and output levels simple. The front panel accessed HI-Z input makes this an amazingly high quality instrument preamp. Comprehensive I/O options allow the mic pre and EQ/COMP sections to be accessed independently of each other, and the order of the EQ/COMP is switchable. A dual function link/ sidechain input on rear panel is provided for inserting external sidechain signals (for de-essing, ducking) or connecting two m103's together for stereo compression applications. Predictably, the m103 is built to last, and proudly backed by Grace Design's 5 year transferable warranty.